I would have tried splitting White at E12 with . Obviously there's a reason why you're all stronger than I am. Fedya, if you do that then it's a good exchange and white will play around 27 and gets both these good points. Compared to black playing at 26 himself that kosumi comes out much more slowly. FWIW, I think that White has the edge after . I. e., Black is ahead on the board by less than 10 pts. As for tewari, both players are over concentrated in the top left, but I don't think much of Black's second line plays. Sonoda had to foresee this position by , if not earlier. I expect that he was OK with it. I expect that Kiyonari was OK with it, too. Regarding the top left sequence: a minor detail, but I'd like to be able to make the following 1-2 corner exchange if possbile before black gets strong there. Perhaps before wedging is the right timing, though it's possible black could play differently afterwards trying to make 1-2 bad. I think that's not just a minor detail, but a valid point, and the only way for b to resist seems to be c14 immediately in response. I don't think a works locally yet. Initially I thought there was a potential ko if W comes out, using a, but where B gets the corner and plenty on the outside first, but now I think it is still unconditionally dead. The aji seems worst if W starts with d14 and W resists with d13 rather than c15, but I think it still dies with the B19 tesuji. If nothing works, w can only use the d13 or b13 sente. The 1-2 exchange will affect the ko variation slightly but it doesn't seem to change ko threat count and the exchange tends be normal fare if W wins the ko and good for W if W loses it. On the other hand, if W gets that good exchange, w's shoulder hit in the game would become ajikeshi, and a more direct invasion around C8 becomes more plausible, so his strategy would have to change. Or at least W would extend after the shoulder hit rather than jumping. Since W's follow ups to block at C11 or turn at E12 become more powerful with that helping stone. Though W's weak ponnuki above remains a liability if B keeps pushing up to fight, but at least when w gets C11, B is sacrificing a lot of territory to fight, and the C16 stone may still help if W gets B12. Perhaps for this reason, I increasingly like B's initial response to the shoulder hit, and feel uncomfortable for W to give up points like this, and only start to dislike b's play at move 33. Regarding H15, I'm still not sure if I would rather it at J17 or if I feel the F17 invasion is bad shape (better at D16 maybe?). If H15 is at J17, the local efficiency is ok for W since B is overconcentrated, but W takes gote while giving up corner aji. Though W may have a better chance to get the 1-2 exchange in later. So I did make the final of the championship, but lost to dhu. I didn't actually mind much as being a new champion means he gets to go to the WAGC (if I won I wouldn't; it'd be some weaker player). Yet again I got close to 2400 but not past it (2395). And I've not played on KGS, nor done tsumego like I said I should (analysing new ideas from AlphaGo is more interesting!). I was black and started off with the AlphaGo (and 19th century) idea that approaching both his 3-4 points to prevent shimaris and then tenuki-ing was good. He then started some forceful play against my lower right corner and I crawled a bunch of times on the 3rd line which didn't feel great but allowed it me to cut and start a good fight, however he wisely sacrificed 3 stones which were small now, but then saved them again when I tried to make a forcing move. He immediately activated his r9 stone (I think tenuki was better), so I let him live on the right side with the option to capture the 4 stones back in sente. His move 88 was maybe overly solid, so I got sente to sabaki with my bottom left approach stone, using a 5th line attachment of AlphaGo. He took the corner, so I had to make shape on the outside, and ended up living by connecting with points along the lower side. 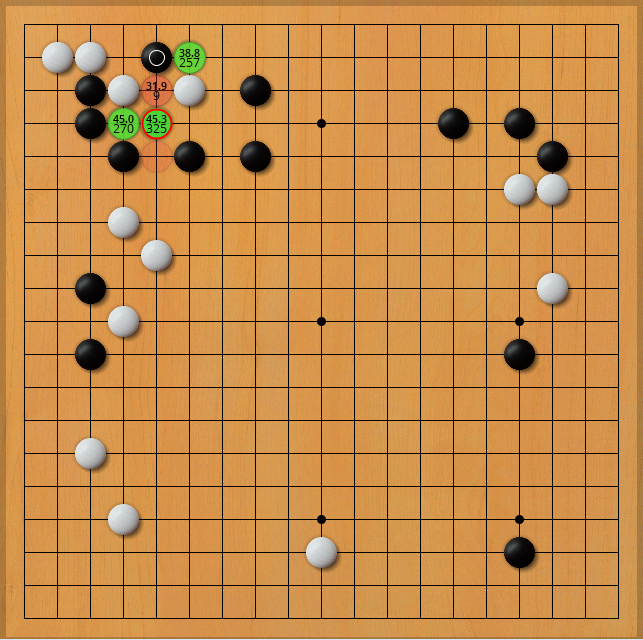 - move 17: k16, also thought about g15 for grander scale moyo and makes him need to spend move to quell c15, but if he does so tenuki seems bad when he k16 invades. But maybe this would let him find a good time to g15 or g16 and swallow c15 big scale. This seemed good with q7 press plan moyo building as miai with saving c15. - move 18: seems he didn't like me to press, didn't expect this one as turns the big shimari into territory. Is this technique more applicable when the r6 stone is weaker without r9 already? - move 27: too obedient? I also though about p2/o2, so he gets r5 in sente and I capture at s5 for good endgame: giving s6 in sente makes r9 too close and I still have a shape attack at p6. - move 30: is this a good move? Embarrassed to say it surprised me. f4 looking good. - move 33 etc: crawling here didn't seem good with his left side framework, but I wanted to save my stones in sente (and make his turn gote) to cut. - move 40: I had spent some time reading the fight if he connects and it seemed good for me, so a good dodge and makes pushing bad. But I can't see a better move order, e.g. if I cut before last crawl then he probably saves so he gets L3 in sente and I cry. - move 42: I expected him to answer so I was happy to r8. - move 44: too early? He has other ways to use this, like o9 in sente. How about tenuki like top left. Chris (board 2) suggested c4 and I wasn't really sure how to handle that (other than tenuki and pretend to be cool like AlphaGo). - move 47: Sensible or slack? Letting him live on side and capture 4 stones in sente to get sente for left side was clearer than the fights. Somewhat sad though that after I capture the 4 stones q7 gap means white lower side wall is not cut, so no attacking prospects on it, but maybe that is a dream. - move 51: here or lower left? I didn't really know what to play in lower left now: my plan was to f5 if he k3 turns to overconcentrate the lower side, but no plan for now. Plus after my k16 I figured he owed move on top left. - move 55, better unplayed? But if I don't there is a chance he gets b14 in sente and then if I cut ataris underneath. - move 59: here or b17? Because I cut he can't easily break through, and I thought centre was important in this game so grow my top moyo whilst reduce his centre. If I slide I don't like his g16 to separate in sente. - move 65: I actually didn't realise he can safely hane. - move 69: trying to be more efficient and bully the corner without cashing b14 aji, but too much? Even if he connects and answers b14 on outside corner is still alive. - move 74: I felt sad now as even though I captured his 2 stones I wasn't alive. Didn't expect him to make this trade but it looks good for him. So what's better? b14 for 69, he answers, then g12 and later I have c18 e18 in sente? - move 88: too honte from him? Though I can now pull out the stone and he couldn't g13 like before thanks to e10 atari. How about c4 to make things hard for me. - move 91: AlphaGo funsies, just playing sabaki by instinct as 15 moves in a minute. - move 110: too honte again? I feared he tries to kill me harder. 114 also looks mistake as helps me make eyes if he can't win ko. - move 125 etc not sure if something better, but live by connecting was easy to read and burned overtime stones. - move 135 I briefly considered tenuki around k12, but let him atari and split in sente can't be good, and centre is miai from top or right side. - move 136: As I still got to play k12 I think this could be wrong direction, maybe he should play around L12 and then if I come in around m/n9 he can reduce my top side. I don't like the exchange for White, because his influence is not working well with the stone at F4. Previously F4 put a stake into the lower side, then he lets you make a solid group at the lower side. move 40: I had spent some time reading the fight if he connects and it seemed good for me, so a good dodge and makes pushing bad. But I can't see a better move order, e.g. if I cut before last crawl then he probably saves so he gets L3 in sente and I cry. Once your stones at the bottom have a lot of liberties, capturing these stones becomes smaller, so why did you cut at 39? Using your sente to play elsewhere (e.g. activating R11) seems more logical. But then when he saves his stones again at 42, all your stones are working again and you get a good result, especially with the aji on those 4 stones. I don't get how these 3 stones could be so important to White. I expected atari from the other side. The bamboo will only prevent White to have sente on the left side, but in return White will spend a move less here. So the "honte" at 88 is almost a consequence of this atari. Aren't you overplaying here? You can reduce bottom and centre. I admire your sabaki capability but White could probably have fought harder. I think there were safer routes to victory. move 136: As I still got to play k12 I think this could be wrong direction, maybe he should play around L12 and then if I come in around m/n9 he can reduce my top side. I think White is lost whatever he tries now. Only a severe invasion of the top can reverse the tables, but his influence doesn't reach that far and you are quite resilient there. I cut because his shape was weak and I wanted to attack his 2 space extension on the right (as compensation for the crawling), so it is using r11 to attack (if white's 2 space is weak then probably I can solidify the gap above r11). The cut's not really about those 6 points, but disconnecting. Problem is that's not easy to do without starting with that cut that's now on small stones. If I'm in a bad position now it seems his n4 was a good move, and thus my s2 was wrong. Maybe, but I felt bad after that left side sequence (didn't think I was leading), and wanted to play the 5th line attach anyway (and had read some sequences earlier which was useful to get lots of overtime stones down quickly). Unless white can answer it with kick in corner (removing sabaki chances there) and then I'm still in trouble after having another move in centre it's unlikely to become mochikomi, and even if bits die I can try to find some way to use them in a reduction. Or is e4 a good answer to the attach making 3-3 and bulge impossible? Solid, but I can still use my stone as part of reduction operations if connecting at e5 is too heavy. Last night I had a rather fun/interesting game in the European league. The opening was Alpha/Leela Zero inspired (I've recently been studying with the Lizzie interface, highly recommended! ), with a kiai-filled tenuki fest in which I ignored a double approach on my 4-4 to press and surround his group. We then had a bit of fuseki on the top side, I took sente instead of the honte defence when he invaded my 4-4, plus a big knight to resurrect my 4-4 stone that was surrounded. Rather than pulling out his cutting stone to start a fight, he extended on the side so I loosely netted it. We had a bit more opening type stuff with him playing territorialy, so I played two attachments to develop the centre, he plopped in a reduction stone on tengen and I probed to see if he'd give me territory or keep centre access to help his reduction. He opted for the former, so he jumped in further to the moyo, but with a big knight move instead of the one-space jump I expected. So I cut it, he jumped out with half the group to safety, but I got a thick shape in the centre and felt good as I'd switched my moyo from upper to lower side. When I grew this, he played a surprising yose move (s15) so I surrounded more, he played a nice shoulder hit reduction but extended one too many times meaning I played a thin net, which ended up capturing him thanks to a cute little tesuji I just managed to find in overtime. He then failed to kill my corner and resigned. Unsurprisingly LZ doesn't like my side move at k17 (-2%), I expect AG wouldn't either but I still have some fondness for such weak human moves. Black's immediate 3-3 struck me as premature (I thought he might finish off lower left 3-3, LZ wants to n17) as k17 means I can reasonably omit the honte capture and take sente to live in the lower left, LZ agrees -4%. LZ says f4 should be e4 which is what I expected and have seen in bot games when they live in this corner later. I thought black's c10 might be soft (vs e15, though I figured I could handle that fight) as it allowed me to "have my cake and eat it" of living lower left and capture d15 cutting stone, but LZ says it's ok, but not a huge fan of my bad-aji net (d11 press best for efficient swallowing up, or e15 honte). p17 is a traditional human territory-closing move, but LZ doesn't like it, prefers r7 to ask eye questions of my wall and make use of s4; and then wants me to r13 attach instead of simple q10 extension. s5 surprised me as a premature yose move (my s4 isn't sente, could make sense if it was) that strengthened me (he lost invasion aji) but maybe he thought it overconcentrates me, LZ -5%. LZ agrees with m17, seems pretty traditional. I thought about g3 cut here but didn't like tenuki or h4 answer, but went for d10 attachment because those are cool these days (LZ likes it). I thought he would probably hane but he was soft/solid/patient again with extend, LZ initially extends then hanes. The plus for him was he got sente when I pulled back and I expected him to reduce at l15 or k16 as this seemed miai, but LZ likes his h3 defence. So I attached again for the lols and there didn't seem much else to do (LZ agrees). LZ agrees strategically with the expected reduction, but thinks tengen was too shallow, but even if deeper thinks I can patiently answer one space behind to defend the territory. I thought about k11 attach to wall off the top territory (expect lots of extends, if he hanes I cut, LZ likes) but wasn't confident of being so passive given all black's solid territory (I suppose LZ is confident of keeping a 5 points lead, I'm not) so r13 attached to see if he would give me some centre kikashi to cut off that escape route in which case I might try to attack tengen (but not so easy as not deep). LZ says r15 was soft but he got sente to go further into the moyo. LZ likes his big knight move even though I can cut it, if one point jump it says just kosumi answer to defend the territory is enough! LZ says L13 dodge was good (I focused on his k11 block and then cut being good for me, considered L12 a bit, should read broader but it's not like dodging refutes my move) but n13 soft, should hane even though I then wedge and cut and fight. Interestingly it initially (2k playouts liked my thick l10 but then at 10k prefers h14 (by 1%) to defend the top territory; even though black did then reduce the top a fair bit I stayed connected and I prefer the centre thickness. LZ doesn't think of my m12 peep (prefers g11 which I considered but decided too dame even though good topologically), which I played to avoid a messy fight if L11 cut, she shows this is fine for me but 50+ moves long so I don't mind playing slightly lossy peeps to avoid such variations. c5 was decent but she prefers a move in lower centre: j7 rather than the k7 I played later. I think c5 is good for me because now that h3 is defended black b4, which morally should be a gote sequence, could lead to me messing up and dying in the corner if I tenuki afterwards (and giving b4 in sente is too sad), so reducing opportunities for me to blunder in overtime is a good game strategy. I expected black d5 as sente for corner pain so was pleased he gave me sente again with e8 but LZ says it's a fine move. I'm pleased I identified the right area of the board with k7, though LZ prefers j7 by about 2%; I was being cautious of the k10 aji. Black then played an inexplicable yose move at s15 (but only -4%, I'm at 90% now and did feel happy in the game), I suppose I have the t15 kosumi sente yose tesuji (didn't see this at time) but I expected something around o11 (LZ's move) or k4, maybe he thought these were still miai? L6 was indeed a nice reduction point, but my k4 was indeed a good move (I could have played it instead of m7 push, but I did that to make my 2 stones into a stronger 3 and give black a chance to go out, but his natural local shape n6 was too much and let me pounce with k4. I was in overtime and didn't expect this to be a clean kill, and LZ says he can get out with L4 but I get some nice profit on lower side. In the game l2 tesuji means j4 wasn't sente on lower 2 stones (LZ prefers firmer h7 atari over h8 net) so then black dies and it's game over. Over the last few days I've been doing some LeelaZero-assisted go problems and reviews with my wife (Sai, yes really, she's about 1d). She's not really played go for the past few years and finds competition stressful. She has quite a contrary, fighting and un-textbookish style which meant her teachers would dismiss her moves as bad. Sometimes I think they were right, but sometimes they were wrong and she likes that LeelaZero often seems to say her moves are actually good . To take an example, a problem from the Kiseido problems for dan players books, on opening/middlegame. I've long had doubts about the correctness of the answers in books like these (particularly in opening vs life & death or tesuji where the answer relies less on judgement, the blurb says compiled by Tadao Sakamaki and Park Michizumi, who are these? translated by Rob van Zeijst 7d), more so now that we know even top pros make loads of bad moves. Yes, given that in life-and-death problems you are expected to make your move work against all possible resistances, it seems pretty sloppy to not attempt something approaching that in an opening/middlegame problem, though there's obviously far more choices in open play and this book only has 2 answer diagrams per problem. Still, devoting that precious space to your opponent's best answer rather than wimpy obedient one would be nice, even if it is more complex so not so easy/simple teaching (and as the last problem in the section for a book for (even weak Japanese) 1 to 7 dans I think such a move should be on the radar). Answering shoulder hits with a pincer like that isn't particularly wacky, there's plenty of old pro examples, e.g. Shusaku. Addendum: However, as a warning against treating LZ's word as gospel, if I make it play the book's 1, then kosumi for white (#2) and next moves all top choices it gives black only 45% to continue at 7 as best move (on 1k playouts). However, if 7 is placement here it's happy to block (59%) but then if black "unexpectedly" pushes through white drops to 40%. It wants to connect at 6 and sacrifice the corner in a trade for pushing through outside rather than squeeze under and take the small gote life. So it seems like early in this variation LZ was willing to tenuki the checking extension the book recommends, but underestimated the severity of the peep later. Not sure if more playouts would solve this (I'm using network #139 if anyone else wants to try before I get my new computer). There's some weird non-reproducability here, I just put it in again as a fresh position and it found the peep as a good move within a few k playouts, 10% over the push out on the side, and expected the same counter peep answer as yours. I wonder if this is just random fluctuations expected in such non-deterministic algorithms, if my previous analysis had somehow biased the search tree, or I misremembered and used a different network before (I think both #139). So we had the British championship challengers' league. I came 2nd with 5/7 and will play the 7/7 winner Sam Aitken 4d in the title match (as one would expect based on ratings going into the tourament). When I was 1/2d Sam was the hot young talent who beat a bunch of 6ds in the British open one year but he went off to live in China for a while and is now back. I've been recording my games and reviewing with LeelaZero, here's one for starters with Boris playing an AlphaGo opening he'd studied, an interesting centre fight, his big mistake and a fun trade which left me well ahead. I posted this in the Pandanet Leela thread as it's from a mid/high dan amateur game related to that, but I found it a striking illustration in how important an urgent power point is so will put here too. (I'm fairly trusting of LZ's judgement in this case). Lost my game in the PGETC promotion match, interesting centre play nevertheless. I also lost, to Matias Pankoke 5d. He approached a lot in the opening, did a solid joseki whilst I made AlphaGo-style shimari and attachments. I constructed a moyo and then attached on top of his 4th line extension, pleasantly surprised to see LeelaZero actually thinks it's a decent move and his answers soft. Then came his reduction and I didn't play so well, making a clumsy shape whilst his group got strong. I switched my moyo to the left, he invaded the lower side (LZ says I should have defended there instead), I let him live (which also unsettled my group) but vaguely connected over the top to also develop left moyo and enjoyed played a cool haengma at 79 which LZ agrees is best as a surround left plus attack middle move. But I then messed up in answering his 80 push in an overly cautious way and got painfully double forced and he then took sente to play a severe attachment and I started to fall apart with the thinness I'd left behind (plus overtime pressure). I got a bit more than I deserved on the left side, and at move 123 might have made it a closeish endgame had I blocked at the lower left, or found the sharp tesuji at tengen that Facebook's Elf engine saw, but in the end played out a 16 point loss.